1) Mobile Phone is the next battle ground for all the popular social network. 2) User experience on most of the leading social network is not comparable to their PC counterpart. One of the reasons why most of the social networks fail to deliver on mobile is because they are not designed with Mobile phone in mind. Mobile is not in their DNA. For a truly mobile friendly social network everything from Workflow to UI to experience should be optimized for cell phone. Very few social networks can claim that . oc2ps is one of them. oc2ps is a mobile social network from One97. From the very design of it you can tell that it’s conceived with mobile as primary channel of usage. from mobile friendly signup to phone book backup and from location tagging of content to suggesting third party mobile application. oc2ps covers every possible scenario where mobile phone can be integrated to your social network . It’s a refreshing take on Mobile centric approach to social network. oc2ps is open to everyone for signup. 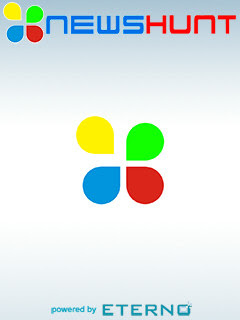 All you need to do is to point your mobile browser to www.oc2ps.com and you can sign up in a jiffy. I tested it using opera mobile 10 beta browser on my Nokia E63 and Native browser of Samsung i8910HD. signup was a smooth, 3 step process. 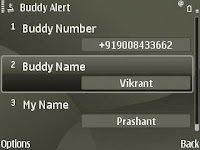 You can register using your cell number or email id as unique identifier. oc2ps sends an activation link to you via email. 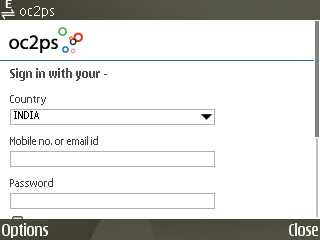 On activation you can update your profile with details like Name, location and profile picture etc. I tried these steps both on GPRS (IDEA /Airtel) and Wi-Fi and it went just fine without a single glitch or inconvenience. oc2ps has exploited the viral nature of cell phone beautifully . 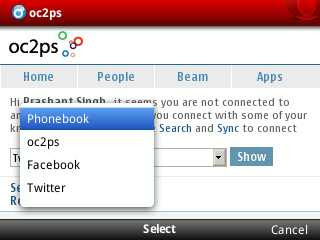 You can invite your friends to oc2ps using three channels, phonebook, facebook, twitter. 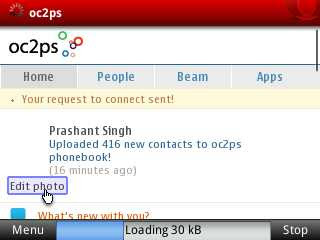 To invite your phonebook contact on oc2ps you need to upload your phonebook contact to their server. On clicking "upload contact" link you receive an SMS with sync setting and you need to save it and than you can simply sync your contact with oc2ps server.A close examination of sync setting reveal that they are using funambol server in backend for syncing phone book on server . Right now they don't allow to sync calendar and SMS but I believe that functionality can be added later. I personally like funambol very much. It’s an industry standard for SyncML server. 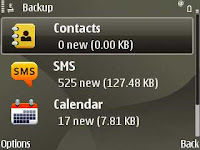 This phone book backup functionality is great values add for end customer as they don't have to use a separate service to backup their cellphone data and they can use that data in their social network too.These integrated approaches to virility in oc2ps make it a unique one stop social networking solution for Indian customer. 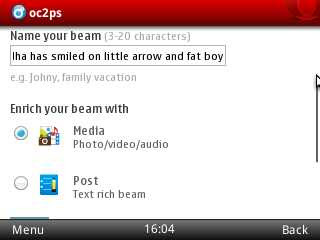 Every user activity in oc2ps is referred as a "beam" and you can tag every beam with location information. 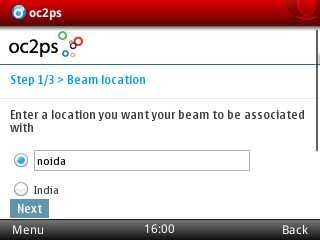 Tagging every beam with a Location is a smart and somewhat futuristic move on part of oc2ps team. It allow user to tap the social activity in their geographical proximity. Although I wasn't able to figurout a way to search for location specific beams in current version of oc2ps but I am sure they will introduce it in subsequent upgrade. With LBS becoming hot topic in mobile industry it’s only a matter of time when you begin to expect it from every social network .that’s when this will come as an advantage to oc2ps. You can also attach any media like photo,video,mp3 with your beam .I tried uploading pictures from my cellphone memory and data card and it worked very smoothly. Even on a relatively slow GPRS connection image upload was swift and thumbnail was clear. I uploaded a 9 sec video to oc2ps and it took close to 15 sec on Wi-Fi and 30 sec on GPRS. This is a good benchmark given that I was using it on peak hours of GPRS consumption. Another cool feature of oc2ps is that it suggest application for your phone. 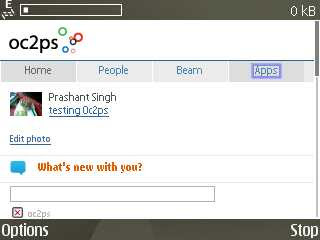 You need to go to Apps tab on oc2ps and browse the app catalogue. As of now they are offering app from getjar but I am sure this channel can be used as an app distribution channel for Indian mobile user. Thanks to virility of social network apps on oc2ps can benefit from word of mouth beam. I downloaded couple of application from their list.They were good . As a mobile centric social network Oc2ps is uniquely positioned to bring social connectivity to majority of Indian consumer who don't have access to PC. oc2ps also offer a monetization platform for mobile content creator and aggregator. Monetization possibility of oc2ps is more important as they plan to go with operators for getting distribution.with right price point and distribution oc2ps can fill a long standing vacuum in Indian mobile ecosystem. All in all I liked the whole experience of using oc2ps. Do give it a shot and let me know how you feel about it ? As an internet junkie I am obsessive about staying on top of developments in my area of interest. So when I started using mobile phone as my primary internet access device it was only natural that first application I looked for was a ticker application for Indian Newspaper. There were very few options and I wasn't satisfied with any of them so I was pleasantly surprised when I got to know about News Hunt .It was closest to what I was looking for . Developed by Eterno Infotech News Hunt is your Mobile Newspaper that allows subscribers to read their choice of dailies on the move. Its a nifty app which aggregate content from Indian News papers and repurpose them for mobile phone screen .The application is supported for more than 200 handsets covering most of the brands available in market. 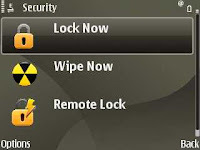 it requires Internet connectivity via GPRS or WiFi for Installation and usage. My experience with installation was smooth .With an app size of only 398 KB it was easy on my GPRS connection . It took me only 2 Min and 4 screen to install it on my Nokia E63 and additional two screens to configure my News preference and App was ready to roll . I was impressed by the catalogue of News paper to choose from . As I write this there were 19 News papers available on News hunt . This include regional dailies like Danik Bhaskar ,Dainik Jagran ,Mangalam and English Dailies like Deccan Herald ,Indian Express etc . You can subscribe to one news paper at a time and change your preference later.Each News paper is further classified in to various news categories like business, sports, technology, national, international etc . Once you are done with the selection of News paper and categories you see list of news snippets on your screen you can go to any of them by vertical scrolling . You can read the complete story by clicking the snippet . There is a news ticker on the top of the screen where you can see the latest news . if you minimize the app you can see the ticker on the home screen of your device . My first impression of News Hunt is very positive .Its easy to use and not very heavy on resources .Some of you might find the choices available in Englsih dailies a bit limiting but I believe that more options will be added in future . What makes NEWS HUNT more appealing to indian users specifically is the fact that it has got support for regional language content. It is a BIG differentiator .In India where literacy rate for English as language is as low as 7% to 8% of the population. It’s a must for any news solution to support regional language content if they want to have a mass appeal. News Hunt also allow you to choose news specific to your state . 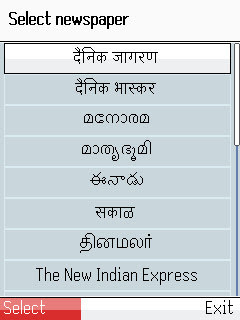 You can set your preference for News from Andhra Pradesh ,Karnataka etc . This can be a very attractive feature for NRI Expats and people staying away from their home state .Another salient feature of News Hunt is placement of advertisements .There were few banner adds between the news items. It was not intrusive at all . They have done a really good job of not letting User experience suffer because of advertisement . News Hunt have got 7.5 Lakh download till date . I had a word with Mr.Chandrashekhar Sohoni ,Co -Founder of Eterno and he mentioned that they are in talks with couple of telecom operators in India for distribution.They are also working with News papers on some new initiative . Things looks very promising for News Hunt . Do try it and let me know what you think ? 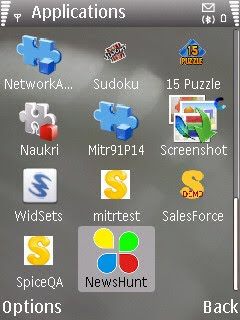 As a mobile enthusiast one questions I often face is "Which application I should install on my cell phone? ", "Suggest me some good apps ." ,"what should I do with my cell phone in addition to calling ?" etc. Surprisingly I got these questions from people who are relatively tech savvy and Who have decent exposure to Internet. If these people are struggling to find a use for their mobile beyond voice than we as an industry have yet to reach them . Thanks to my job I have used a lot of mobile application. I feel qualified to say that there is an application for EVERY conceivable user need. But the big question for indian mobile phone user is :where to start with mobile apps ? and the big question for Indian Mobile app Industry is : What are the Common minimum requirements of Majority of Indian Mobile phone users? Some obvious candidates are things like photo sharing, email, IM, gaming, job search, travel, stock etc. But How well these requirements are being served? In the days to come I will be reviewing some apps from each of these categories. I will be evaluating them on features, functionality and ease of use.Do let me know if you agree with my analysis. and if you know of any app which fits the description please let me know . I would love to have a look.